This article submitted by Linda Stelling on 12/13/00. The arrest of a St. 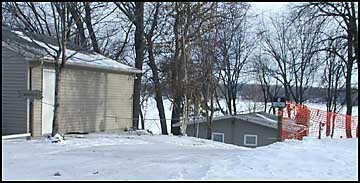 Cloud man led to the discovery of a methamphetamine lab on Rice Lake last week. After James Michael Strate, 34, was arrested on drug and weapons charges, officials learned about a cabin on Cyrilla Beach Point (pictured at right) owned by his father. A search of the cabin on Monday, Dec. 4, revealed three explosive devices, a quantity of flash powder, numerous booby traps ready to be set, a fully operational meth lab with no finished materials, chemicals used for making methamphetamines, two rifles, and a pistol. Because of the chemicals involved, meth labs are treated as hazardous sites. Safety Clean, a company from Minneapolis that specializes in handling hazardous materials, was called in to do the cleanup. The Minneapolis Bomb Squad detonated the explosive devises and booby traps found at the cabin. Stearns County Deputy Doug Pearce said the materials used to manufacture methamphetamines are highly explosive and combustible. If mishandled, they could explode and hurt or kill people. Strate made his first federal court appearance on Tuesday, Dec. 5. He has been charged with the manufacture and possession of methamphetamine. His case is being reviewed by state and federal authorities for prosecution. More charges are pending against him by the Tobacco, Alcohol, and Firearms Department. Assisting in the investigation are the U.S. Attorney's office, the Minnesota Bureau of Criminal Apprehension, the Stearns County Sheriff's Department, and the Central Minnesota Drug Task Force. He is being held in the Hennepin County Jail. If it hadn't been for a neighbor burning a hot dog and filling an apartment with smoke, authorities might not have discovered Strate's St. Cloud lab on Sunday, Dec. 3. The St. Cloud Fire Department was called to the apartment building where Strate lives for a fire. Unable to find the source of the smoke, firemen went door-to-door looking for it. Upon knocking at Strate's door, they were greeted by Strate holding a shotgun. The firemen detained Strate until the St. Cloud Police arrived. After securing a search warrant, police officers found a small amount of drugs, ingredients used in the manufacture of methamphetamines, several ingredients used to make bombs, and about 20 firearms, including modified shotguns. "We feel there is a problem in Stearns County and the department is working closely with the Central Minnesota Drug Task Force," Pearce said. David McLaughlin, task force director, said the problem is growing. Last year the task force found 18 meth labs in the Stearns County area. This year the number is running along the same lines, he said. Meth labs are hard to identify, McLaughlin added. No two labs look alike, he said. When they are not in operations, materials for a meth lab can look like a box of junk: pyrex glassware, buckets, hot plates, batteries, and rock salt. McLaughlin said a portable lab can fit in a trunk of a car or even in a suitcase. Meth labs can be set up in a motel, rural farm houses, or even next door. Paynesville Police officer Kent Kortlever said other meth labs probably exist in the Paynesville area. It's just a matter of finding them, he added. On Nov. 28, the Meeker County Sheriff's Departmen apprehended Brad William Eager, 19, of St. Cloud, in Watkins trying to steal material for methamphetamine manufacturing. A search of Eager's vehicle revealed a meth lab within the vehicle, which was dismantled and disposed. Methamphetamine is commonly manufactured by taking over-the-counter medication and separating the active drug using common household chemicals. Meth can be made in several forms. In its hard form, methamphetamine looks like a small piece of candy. When broken down, it's a powder. Methamphetamine, also known as speed, sells for $125 a gram, an amount about the size of a package of Sweet and Low. Methamphetamine is often white in color. Depending on the chemicals used, it can also be yellow, pink, dark brown, or orange. Meth labs are not only illegal, but they are dangerous. (See the box for warning signs.) If you suspect a meth lab in your neighborhood, call 911 immediately. Methamphetamine is a stimulant that is used in the treatment of obesity. Methamphetamine is produced and sold illegally in pill form, capsules, powder, and chunks. It can be smoked, sniffed, swallowed, or injected. Its names include speed, crystal, ice, and crank. Side effects of its use include irritability, nervousness, insomnia, nausea, hot flashes, dryness of the mouth, and hypertension, according to an drug awareness website. Excessive doses can produce mental confusion, severe anxiety, and paranoia. Long term effects include fatal kidney and lung disorders, possible brain damage, depression, disorganized lifestyle, liver damage, malnutrition, decreased social life, insomnia, and poor coping abilities. Withdrawal symptoms include severe cravings, restlessness, mental confusion, and depression.  Lots of traffic coming and going from home, but nobody staying long.  Used coffee filters with reddish or whitish paste substance.  Lots of gallon containers of acetone and Coleman fuel.  Blue valve on LP cylinder as it contains ammonia instead of propane.  Metal railings corroded and discolored from use of caustic materials.  Large amount of lithium or sodium batteries.  Call 911 and notify the police.